Toss the shredded turkey with the chopped parsley. Season with salt and pepper. Place 4 tortillas on a work surface. 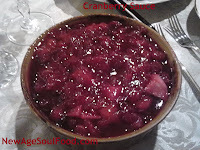 Spread with 1-2 heaping tablespoons of cranberry sauce (if using). Cover with the turkey and parsley mixture and cheese. Top with the remaining 4 tortillas to close the quesadillas. In a large grill pan or skillet, brush 1 tablespoon butter over medium-low heat. When the butter is melted place one of the quesadillas in the pan. 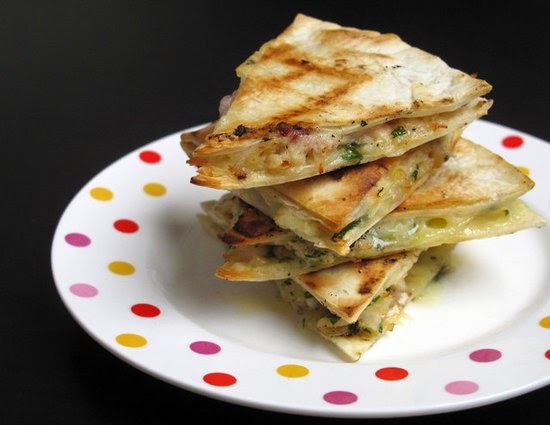 Cook until the cheese is melted and the tortilla is browned, about 6-8 minutes. While it cooks, spread the other side with a little bit of butter. Flip and cook on the other side, until the cheese is melted, the meat is heated through, and the outside is browned and crispy. Repeat with the remaining quesadillas. Slice into wedges and enjoy with the avocado, if desired. Assemble the sandwich and brush the outside with a bit of oil. Grill the sandwich over medium heat until golden brown on both sides, about 2-4 minutes per side. Butter one side of each slice of bread using 1 Tbsp of the butter. 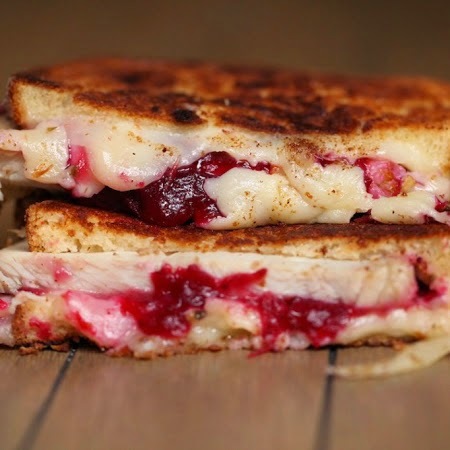 Place provolone on top, then pepperjack, then cranberry sauce. Place turkey and other slice of bread on top, butter side out (if you like the turkey to be hot, heat it a little before putting it on the sandwich). Melt remaining butter in a skillet over medium-low heat. 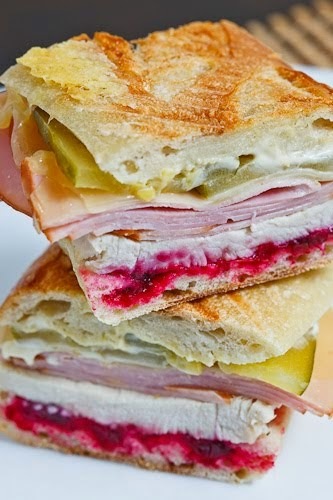 Place sandwich on the skillet and let it cook slowly until golden-brown on the bottom, about 3 minutes. Flip onto other side and continue to cook until both sides are browned. Slice in half and enjoy! Any leftover Thanksgiving sides will do for this dish (green beans, greens, mashed potatoes, yams, etc.). On a floured surface, roll out pie dough a bit thinner than your average crust. 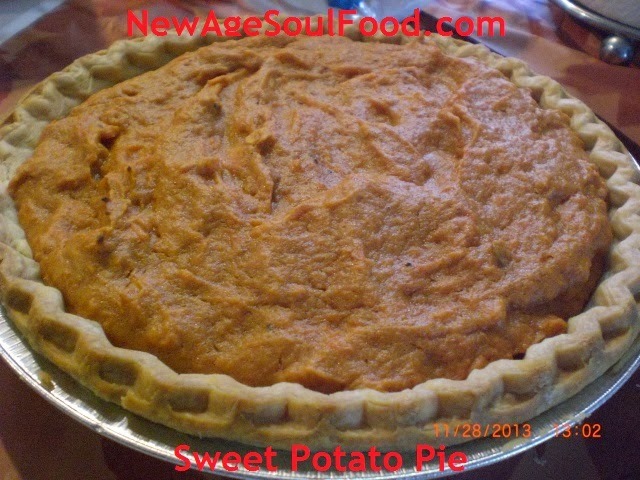 Use a 4” pastry/cookie cutter or a bowl turned over to cut out the empanada crust. Gather the remaining dough, roll and repeat. You should have 12 circular crusts. 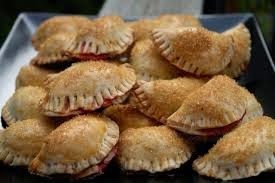 Place a ham or turkey or both strips on each crust and then top with your choice of leftover side dishes (mix and match as you please but only use about 2 tablespoons total or your empanadas will not close properly). Brush a bit of the egg wash on the edge of each empanada, fold over then press with a fork to close. Poke a few holes on top with your fork to vent. Place empanadas on a baking sheet and brush tops with the egg wash. Bake for 20 minutes or until brown. Rest on a rack for 5 minutes before serving. 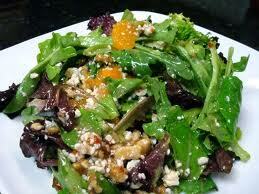 In a large bowl, toss the salad greens, oranges, blue cheese and pecans. Just prior to serving, add the dressing and toss until thoroughly mixed. Do not saturate greens with dressing ¼ cup is sufficient to moisten and flavor the salad. In a large stockpot, add all ingredients. Bring to a boil then lower heat to medium low and cover. Cook for 1 – 1 ½ hours or until everything is soft; when soup is done, remove the bay leaf. 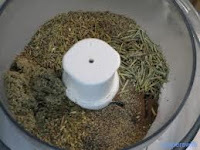 Remove pot from the heat; if you have an immersion blender (hand wand) puree soup in the pot. If you do not have an immersion blender, transfer soup in batches to a food processor or blender and puree, then return soup to the pot. Continue cooking uncovered an additional 15 minutes or until the soup reaches the desired thickness. Keep in mind that once the soup sets, it will become twice as thick. Note: Turkey should be seasoned 1 day prior to cooking. If turkey is frozen allow 3 day for it to thaw in the refrigerator. Remove giblet bag from turkey clean it inside and outside thoroughly. Pat it dry with paper towels then generously sprinkle the inside and outside with salt, pepper, garlic powder, onion powder and poultry seasoning. (It is best to purchase new poultry seasoning or make it fresh.) Wrap the bird in foil and let it sit over night. Try and purchase all ingredients from a specialty store that sells herbs and spices in bulk. This way you can purchase only the amount that is needed. In a small bowl, mix together the peanut oil with 1 tablespoon each of the following: garlic powder, onion powder and paprika and 1 teaspoon salt and 2 teaspoons poultry seasoning. Remove the turkey from the refrigerator and unwrap. Drain turkey of any excess liquid that may have accumulated then rest it on the foil. Massage the oil mixture over the turkey making sure you coat it inside and out thoroughly. Coat the paper bag thoroughly with the remaining oil mixture. Add more peanut oil if needed to coat the bag. To ensure that the bag does not catch fire, you must use peanut oil. Place the paper bag in a roasting pan, insert a roasting rack (if you have) in the bag and place the turkey on the rack then staple the bag shut. 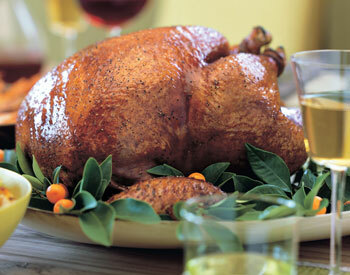 Put pan in the oven and bake undisturbed 10 minutes per pound (a 12 pound turkey will cook in 2 hours). After the cooking time has elapsed, remove turkey from oven and let it sit in the unopened bag 1 hour before serving. Note: Even after the turkey is removed from the oven it will continue to cook. Just know, that if you followed the instructions your turkey will be done, juicy and golden brown. Do not over crowd your oven. The more food you have in it, the longer it will take your food to cook. Note: This dish can be put together 24 hours prior to actually cooking. Just moisten with ½ cup of vegetable broth prior to baking. In a small bowl, combine vegetable broth and cranberries; let soak for 30 minutes. In a large skillet, heat oil over medium heat. Add onion and sage, saute 3 minutes. Add bell pepper, celery, garlic, poultry seasoning and salt; cook for a few minutes stirring frequently until tender. Add apples and cook for 3 minutes, stirring frequently. Remove from heat and add vegetable broth, seasonings and stuffing mix. Mix gently to combine then spoon mixture into prepared dish. Bake for 30 to 40 minutes or until center is set. Sort through cranberries and remove stems or bad berries rinse, then set aside. Mix sugar and water together and bring to a boil. Add cranberries, oranges, allspice and cinnamon. Cook over a medium flame, uncovered until berries pop open stirring frequently. Add pineapples, reduce heat to a simmer and cook 45 minutes - 1 hour or until desired thickness is reached stirring occasionally. Sauce can be served hot or cold. Cut tips off the beans, rinse and place beans and bay leaves in a large pot filled with water. Bring water to a boil and boil the beans for 3 minutes. Drain beans and set them aside. In a large sauté pan, heat olive oil then add all ingredients. Sauté until beans are done approximately 10 minutes. Taste for salt and pepper and adjust seasoning accordingly. Remove bay leaves before serving. Cook macaroni until its al dente: In a large pot, pour in 4 quarts of water add the bay leaf, salt, granulated garlic and granulated onion and bring to a boil. 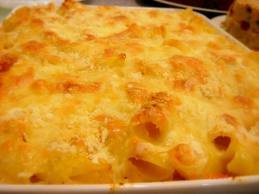 Add macaroni, stir and bring water back up to a rapid boil. Once water is boiling, stir again, cover pot and remove it from the heat. Let the pot sit covered and undisturbed until the length of cooking time stated on the box is reached. Approximately 6 minutes. Once the cooking time has elapsed, drain the pasta and remove bay leaf, then return macaroni to the pot. Add the warm milk mixture to the pot along with in the cheese and mix until well combined. The cheese does not necessarily have to be melted, just make sure its well distributed throughout the dish. Mixture should be moderately moist, if needed add more milk. Taste for flavor and adjust the seasoning accordingly. Transfer mixture to a baking dish. Cover dish with plastic wrap and then cover with foil. Bake for 30 minutes, then remove the foil and plastic wrap and bake uncovered another 15 minutes or until casserole is slightly browned on the top and all the milk is absorbed. With a slotted spoon, remove cinnamon and cloves. Wash potatoes and slice them in half, lengthwise. Sprinkle each half with pumpkin spice mix. Let potatoes cool down just enough to peel. 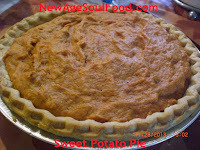 Place peeled potatoes in the bowl of your electric mixer affixed with the paddle add all other ingredients except the crust and mix on medium low until you have a puree. Prepare crust according to the instructions on the package. Pour filling into the partially baked pie shell, make sure your oven is still on 350 degrees and bake 60 minutes or until pie is set in the middle.